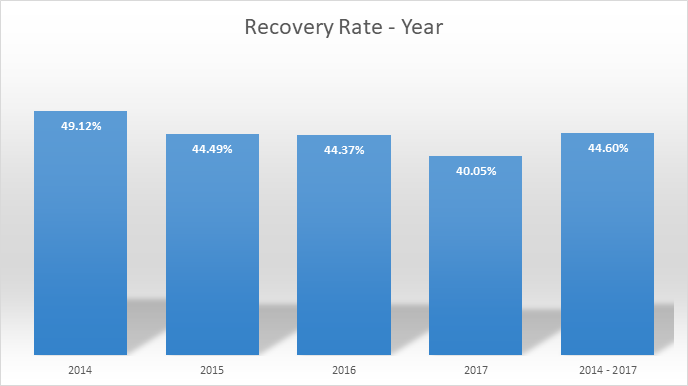 On first glance, this may appear to show that the success of our recovery process has slightly decreased since 2014. However, it is important to note that the latest year will almost always show the lowest recovery rate. Quite simply, this is because the loan is moving through our 3-step collection process and is not yet generating a cash flow or has only recently started generating cash flow. A total of €6,235,926.74 was recovered between 2014 – 2017, an increase of 4.12% since last month. In 2017, the largest amount of cash recovered was in Estonia with a total amount of €548,183.56, an increase of 13% on the absolute amount since last month. 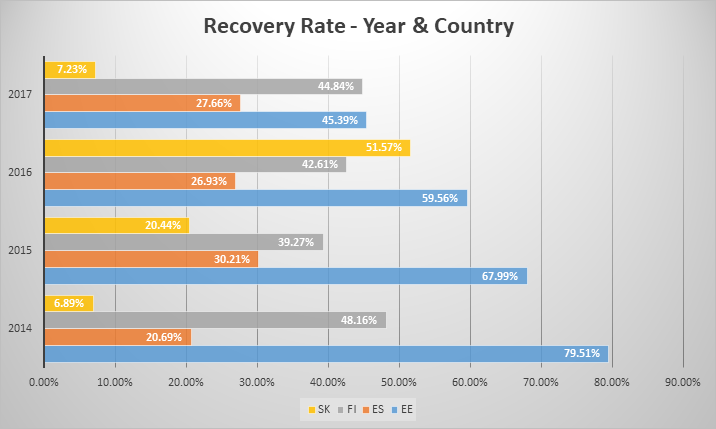 Thanks to the large increase of recoveries in Estonia, it has now overtaken Finland (44.84%, €369,856.48) with the highest rate of recovery in 2017 (45.39%). It’s important to remember that these statistics will continue to change over the coming months, we explain why in the next section. Historically, recovery rates have always been the highest in Estonia. Take 2014 as an example, the rate for this period is 79.51% and a huge €847,873.41 recovered. Looking backwards from 2017, you can see the rate of recovery increase over each year in Estonia as more time is allowed for the cash flow to come in.